The town is the location for the annual English Language Camp arranged by the American-Polish Partnership for Tczew. 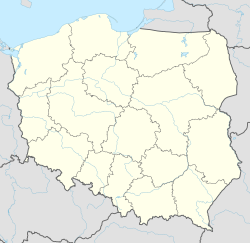 Tczew is located on the west bank of river Vistula, approximately 30 kilometres (19 miles) south of Gdańsk Bay at the Baltic Sea and 35 kilometres (22 miles) south-east of Gdańsk. Tczew (Trsow, Dersowe, ‘weaver's town’) was first mentioned as Trsow in a document by Pomeranian Duke Grzymisław bestowing the land to the Knights Hospitaller in 1198. Around 1200 Sambor I, Duke of Pomerania, built a fortress here. In some documents, the name Derszewo appears, which stems from the name of a feudal lord, Dersław. It is unknown whether Trsow and Derszewo referred to the same or two neighboring settlements. In order to obtain better control of traffic on the Vistula, Pomeranian Duke Sambor II moved his residence form Lubiszewo Tczewskie to here. By 1252 the settlement was known by the names Tczew and Dirschau. In 1260 it became a town and received Lübeck rights, Tczew was purchased by Heinrich von Plötzke of the Teutonic Knights following the Treaty of Soldin in 1309. It was rebuilt from 1364–1384, and was granted Kulm law by Winrich von Kniprode. In 1434 the town was burnt down by the Hussites. After the Second Peace of Thorn (1466), it was transferred from the Teutonic Order to the newly created Polish province of Royal Prussia. During the Protestant Reformation most of town's inhabitants converted to Lutheranism. In 1626 it was occupied by king Gustav II Adolf of Sweden, who built a pontoon bridge across river Vistula and who had his camp at the southern side of the town. Although it was rebuilt, it then suffered during the Polish-Swedish Wars. In a nearby battle on 2 September 1657, the Poles were defeated by the combined troops of Brandenburg and Sweden under general Josias II, Count of Waldeck-Wildungen. The region was annexed from the Polish-Lithuanian Commonwealth by the Kingdom of Prussia during the First Partition of Poland in 1772. Dirschau became part of the newly founded Province of West Prussia. During the Napoleonic invasion in Prussia the town was occupied by Polish troops of General Jan Henryk Dąbrowski in 1807, but became Prussian again in 1815. It became part of the German Empire in 1871. The town grew rapidly during the 19th century after the opening of the Prussian Eastern Railway line connecting Berlin and Königsberg, with the Vistula bridge near Dirschau being an important part. After World War I as a consequence of the Treaty of Versailles Tczew became part of the Polish Corridor and was incorporated into the Second Polish Republic. On January 30, 1920, Polish General Józef Haller arrived in the town with his troops. The town became a center of cultural activities of the German minority in Poland, a German-language school and a theater was founded. The regional member of the Polish Parliament represented the German minority. According to the city's website, Tczew was the location of the start of World War II when German bombers attacked Polish sapper installations to prevent the bridge from being blown up at 04:34 on 1 September 1939 (the shelling of Westerplatte commenced at 04:45). During the time span 1939–45 Dirschau was integrated into Reichsgau Danzig-West Prussia of the administrative district of Regierungsbezirk Danzig of Germany's Third Reich. After World War II the town, was one of the most damaged cities of Gdańsk Pomerania. Virtually none of its remaining factories were capable of production. There had been considerable loss of population down to around 18-20 thousand people. Shortly before the end of World War II it was occupied by the Soviet Army. After the end of war the town became part of People's Republic of Poland and renamed Tczew again. German residents were dispossessed and forcefully expelled; Polish residents took the first effort of reconstruction, and revitalization. Currently, there are several companies in the electrical industry and machine building. Bridges on the Vistula River – located by Jana z Kolna street and the Vistula boulevard are Tczew's main sights. The road bridge was the first one to be constructed, between 1851 and 1857. At the time, with its 837 metres’ length, it was one of the longest bridges in the world. Originally, the bridge had ten towers and two gateways – today only four towers remain. The other, railway bridge, was built between 1888 and 1890, when one bridge was no longer sufficient. On 1 September 1939 at 5:30AM, the bridges were destroyed by Polish sappers in order to prevent the German Army from accessing the city from the other side of the Vistula River. The bridges were rebuilt in 1940 and destroyed again in 1945 by the Germans. The final reconstruction of the bridges took place between 1958 and 1959. Municipal Park – located in the centre of Tczew, between Kołłątaja, Bałdowska, and Sienkiewicza streets occupies the area of 37 acres (15 ha). The lower part of the park arose in the second part of the 19th century, the upper part in the 20th century. In the park you can see an amphitheatre where, during the summer, many concerts take place. By the entrance to the park a monument of Tczew's scouts killed during the World War II is situated. For the last 19 years, the town has been the host location for the annual English Language Camp. The camp, often nicknamed "Camp Tczew" is hosted by the American-Polish Partnership for Tczew and offers students a three-week program where they have the opportunity to interact with Americans and improve their English. ^ a b c d e Meyers Großes Konversations-Lexikon, 6th edition, Vol. 5, Leipzig and Vienna 1903, p. 43. ^ Historia Pomorza, Tom 3, Część 2, Gerard Labuda Wydawnictwo Poznańskiego Towarzystwa Przyjaciół Nauk, 1996, page 144. ^ Johann Friedrich Goldbeck: Vollständige Topographie des Königreichs Preußen. Teil II, Marienwerder 1789, p. 52, no 2. ^ Michael Rademacher: Deutsche Verwaltungsgeschichte Westpreußen, Kreis Dirschau Archived 2010-05-16 at the Wayback Machine (2006) (in German). ^ August Eduard Preuß: Preußische Landes- und Volkskunde. Königsberg 1835, pp. 390–391, no. 24. Wikisource has the text of the 1911 Encyclopædia Britannica article Dirschau.